When doing development for the OSB I usually don’t do this with the sbconsole, I use eclipse instead. In my current project we use the WTC to connect from the OSB to the Oracle Tuxedo server. Inside the OSB it is possible to create a business service for the tuxedo protocol. This can be done inside the sbconsole but also inside eclipse. 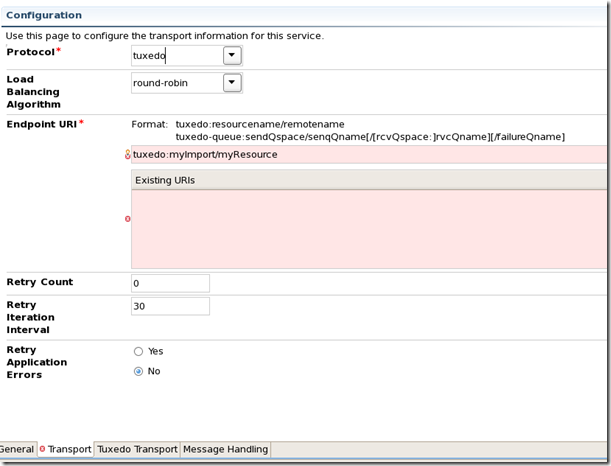 The problem occurs when we try to configure the endpoint uri at the Transport tab. Using sbconsole it was possible to use for resourcename and remotename the values configured in WTC import. But when setting the same values with eclipse validation errors popped up. And I can understand eclipse! Eclipse doesn’t have a connection to the OSB server and doesn’t know what kind of resources are defined there. I was not able to create a connection to the OSB server ore configure something to fix this issue. That’s why I was not able to finish the configuration for the business service with eclipse. My workaround for the problem was to configure the business service with sbconsole, export the project as a jar file, extract the business service form the jar file and place it to the correct position on my eclipse project. I was able to use the business service inside of the message flow of the proxy service without any errors. Also the build and deployment was possible without any errors. 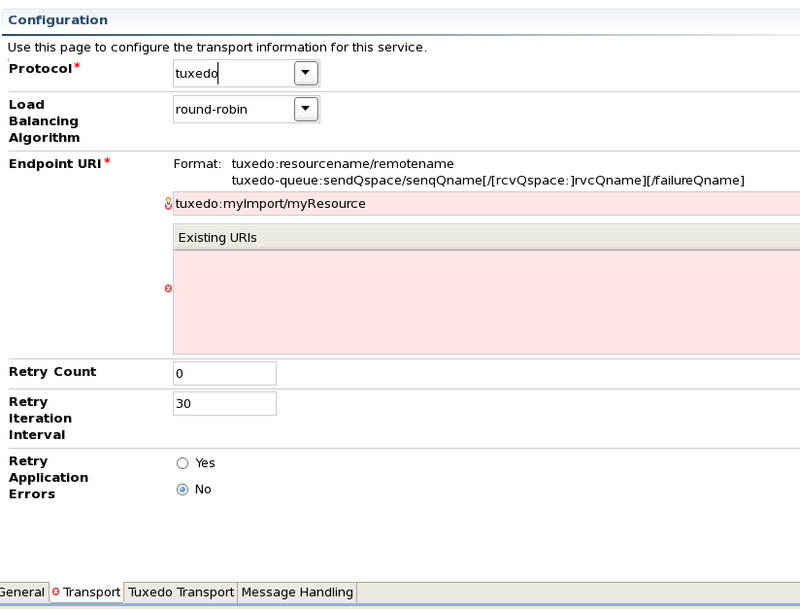 Only when opening the business service inside of eclipse the errors popped up again. Middleware, OPITZ-CONSULTING, OSB, Problem. permalink.